To prepare for the inevitable shedding and possibly the loss of more than a few strands, I recommend a shower stall drain protector! These babies work like a charm to collect shed hair and to prevent hair from collecting in your drain, leading to possible clogs. For as little as $10, these are available on amazon, at target or walmart, or your local hardware store. They come in multiple sizes for your sink and or shower! Some of them even come with a water-proof adhesive that stick easily to your drain! 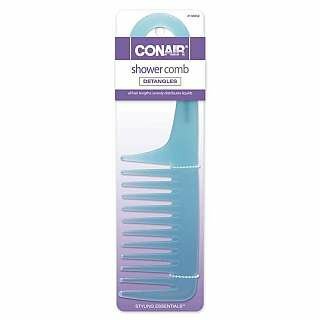 Shower Comb: This comb in an irreplaceable staple! Although any wide tooth comb will do for detangling, the curved hook on this particular comb makes it convenient for your natural hair shower needs! I can easily remove any shed hairs and then hang the comb, via the hook, in the shower for another day. 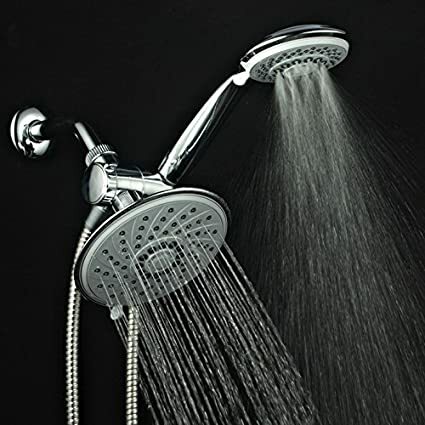 Dual Shower Head System: My dual shower head makes showering and rinsing my hair a smooth process. Also, I find that I don’t freeze if I’m washing my hair because the mounted shower head allows for the flow of water onto me while I wash my hair with the additional shower head. I also love that it features different functions that allow me to change the water pressure. This comes in handy when I’m rinsing out clays, as the added pressure removes the clay without too much intervention from me. Finally, I use the removable shower head to help clean the shower walls! I can easily direct any hair or product on the shower walls to the drain. a Wire Hanger! Though Mommy Dearest would not approve of hanging pretty dresses from them, she may not object to using one to unclog a drain. The diagram above demonstrates how to modify the hanger to get the job done. With a little elbow grease, your drains could be flowing freely in no time. 5. Drano — The quick and dirty method of removing a drained clog is to pick up a bottle of drano! It’s fairly inexpensive and easy to do! 6. Shower Caps — This year I’ve gotten away from shower caps for the most part. The only time I wear one is if I am wearing a stretched style and don’t want my hair to shrink (braid, twist, or blow out, etc) from absorbing moisture. 7. Shower Mat — This bad boy will keep you from having a nasty fall, slipping in all that hair product! 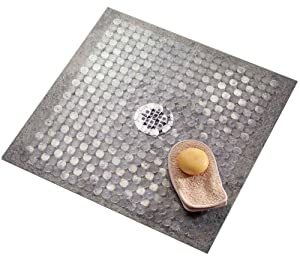 Place this mat on top of your shower stall drain protector, if you have one! This short list is at minimum what’s needed to make your wash day go by a bit more seamlessly! Please share your shower tools secrets in the comment section below! 1. Shower Stall drain Protector, how do I order this, the Target in Del Sur, CA does not have it, please let me know how to order it. Have been looking for this and unable to find at any local stores, including Home Depot. The Shower Stall Drain Protector.